This Gartner Report is very informative and speaks to the disruption SD-WAN in the Enterprise. Marcum Technology has industry experts with deep expertise in SD-WAN whom can architect and implement a strategy custom tailored for your business. Many infrastructure vendors have launched software-defined WAN (SD-WAN) products with different functional, operational and financial propositions, making it challenging for I&O leaders to select the best vendor and product to meet their needs. Many providers have launched managed SD-WAN services with different service scopes, geographic reach, and business models, making it challenging for I&O leaders to select a provider and service best able to meet their needs. Focus vendor selection on immediate gain as a tactical solution; plan for a three-year depreciation, as it is too early to predict any long-term winners. Reduce SD-WAN vendor lock-in by choosing solutions that are based on open x86 hardware platforms with virtualization capabilities. Include contractual provisions that guarantee a change in vendor in case of problems with the vendor being used, such as acquisition, at full responsibility and cost of the service provider, by including technology refresh clauses in the contract. Focus service evaluations on contract terms and conditions to ensure they enable service configuration changes, fast site roll-out and granular application reporting. Network leaders are migrating to SD-WAN to manage their next generation of WAN solutions. As of March 2017, we estimate there are over 3,000 SD-WAN deployments, with more than 80% of those in production, including in more than 100,000 total branches. As described in Note 1, network leaders are increasingly using SD-WAN as a replacement for their existing branch office WAN solutions due to increased flexibility and ease of using low-cost internet services, as well as to avoid new router purchases. Gartner forecasts show a 57% annual growth in SD-WAN spending through 2020, and, at the same time, a 23.2% decline in router spending. In response to strong interest in modernization of the enterprise WAN edge, vendors continue to introduce an array of new SD-WAN products and services to the market. Because these solutions are new, and often delivered by new and lesser known vendors, it can be challenging for enterprise network leaders to determine which solutions best meet their requirements (see "Technology Insight for Software-Defined WAN (SD-WAN)" and "Market Guide for WAN Edge Infrastructure" ). It is, however, possible to divide these solutions into broader categories that enable easier comparison and thus solution selection (see Figure 1). The WAN edge infrastructure market is a consolidation of key branch office network WAN edge functions; SD-WAN, routing, security and WAN optimization, which together constitute the full functionality needed to design a branch office WAN edge solution. 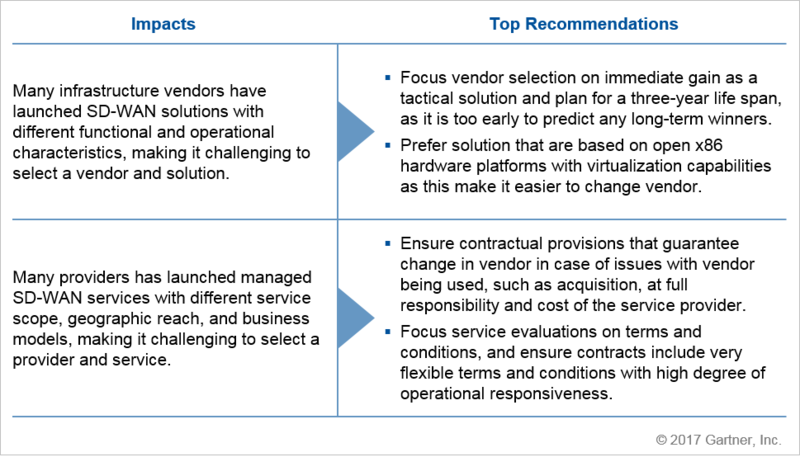 This also means that vendors from multiple functional areas are placing increased focus on these solutions. The current level of offer maturity in each area depends on which area the vendor originates from (see Figure 3). Networking vendors such as Cisco and Huawei are moving into the SD-WAN space via an evolution of their routing platforms (Cisco via an evolution of the Integrated Services Routers [ISR] 4400 and Huawei via the AR Series routers). Both of these platforms inherently support good routing capabilities, as well as legacy WAN interfaces. Many security features, such as firewall and IP VPN, are also available on these routers. WAN optimization is only available from Cisco. However, these platforms do not support a flexible logical SD-WAN topology overlay or rich application policy management within that overlay, and operational efficiencies remain constrained by the router platform. WAN optimization vendors, such as Citrix, Silver Peak, Riverbed, FatPipe Networks and InfoVista have moved into the SD-WAN space via an evolution of their application identification and management capabilities. They have all added a flexible logical SD-WAN topology overlay, or rich application policy management within that overlay, and operational efficiencies via central policy controllers. While these platforms have evolved to include routing and security capabilities, enterprises still need to ensure that these capabilities meet enterprise requirements, such as full routing or full firewall support. These platforms do not support other functions such as IP telephony. WAN virtualization vendors, such as Talari Networks, Ecessa, and Peplink are moving into the SD-WAN space via an evolution of their application identification and traffic management capabilities. They are doing this by adding a flexible logical SD-WAN topology overlay, or rich application policy management within that overlay, and operational efficiencies via central policy controllers. These platforms are evolving advanced routing and security capabilities more slowly, and so enterprises still need to ensure that these capabilities meet enterprise requirements, such as full routing or full firewall support. These platforms do not support other functions such as IP telephony. Few security vendors have moved in the SD-WAN space. Cisco and Huawei have via their integrated routers as described above. Two legacy security vendors, Fortinet (FortiWAN) and Barracuda Networks (NextGen Firewall F-Series), have evolved application identification with a logical SD-WAN topology overlay and good application policy management. The platforms support adequate routing, but provide no WAN optimization beyond compression and do not support other functions such as IP telephony. Several pure-play SD-WAN vendors, such as CloudGenix, VeloCloud, Viptela (being acquired by Cisco) and Versa, have emerged with a key focus on developing SD-WAN solutions. These solutions have been designed from the ground up, without any legacy constraints, to deliver flexible logical SD-WAN topology overlay, rich application policy management, and high degrees of operational efficiencies via central policy controllers. While these platforms have evolved with routing and security capabilities, there are significant variations among vendors, and currently none supports WAN optimization. These platforms do not support other functions like IP telephony. How should network planners approach SD-WAN infrastructure sourcing? While SD-WAN as a technology is rapidly maturing, there is still not one single vendor that can deliver on all functional and operational aspects, as described above. While these products continue to evolve at a rapid pace, Gartner expects that it will take two to five years before they reach the Plateau of Productivity on the "Hype Cycle for Networking and Communications, 2016." At the same time, the market is becoming increasingly crowded, growing from around four vendors at the end of 2014 to more than 30 in the first half of 2017. More vendors, such as Juniper Networks, HP Inc. and Dell, are likely to enter this market, which also is leading to a risk of several vendors disappearing or being acquired within the next two to five years. For example, in 2Q17 Cisco announced its intention to acquire Viptela. This creates a dilemma over which vendor to choose. However, it is too early to proclaim any "winner" and enterprise network leaders should choose solutions that have short-term tactical benefits and plan for a three-year depreciation. Do not choose multivendor solutions as a means to reduce risk because all solutions are proprietary and not interoperable (apart from northbound APIs), which means that using multiple vendors will only increase complexity and cost. Instead, choose a solution that is based on open x86 hardware platforms with virtualization capabilities, as this can make it easier to change vendor. When buying a service, enterprises must always focus service functionality and performance. Focusing on the equipment will not reveal specific service functions delivered by the provider; it often will deliver a subset of the vendor's feature set. Permutations of equipment and transport are being integrated into new services in ways that we have previously not seen in the market. Figure 4 illustrates a traditional managed WAN service including a managed WAN router and an SD-WAN overlay. The end-to-end integration of the SD-WAN overlay with the transport in a managed hybrid WAN is emerging from several carriers and managed service providers (MSPs). Generally, there are four types of providers available in the market that are offering all or some of the service components illustrated in Figure 4. These providers are summarized in Figure 5. Several carriers (including Aryaka, AT&T, BT, Orange Business Services, CenturyLink, Colt, Singtel, Tata Communications, Masergy, Windstream, Telstra and Verizon) have launched managed SD-WAN services. Several providers, such as Aryaka and Singtel, offer more granular application visibility and application control, as well as a customer portal with increased self-service and policy configuration control. Most of these global providers have introduced managed hybrid WAN within the past two to three years, and they now offer it via SD-WAN as well as traditional solutions. This option is a good choice for enterprises seeking managed WAN services without a need for extensive customization or flexibility of transport choices. Several MSPs and system integrators (SIs), such as Dimension Data, Wipro, Coevolve, Videns IT Services, T&A Systeme, Logicalis, Point5, Cygate and HCL Technologies, have launched managed SD-WAN services. These providers do not own any WAN infrastructure, but will manage SD-WAN as an overlay to third-party WAN services such as AT&T, BT or Telstra. However, some providers, such as IBM, Dimension Data and Point5, will also manage the end-to-end WAN connection as well as the WAN providers. All these providers offer managed hybrid WAN based on MPLS and internet services, and some providers, such as IBM, operate hub nodes to integrate WAN services and connect to cloud services. Network leaders need to specifically evaluate the scope of these services, as well as all guaranteed performance metrics. This option is a good choice for enterprises that need greater customization or professional services/operational support than carriers offer. Vendors, such as Cisco Meraki, Cybera, InfoVista, ZeroOutages (by XRoads Networks), TELoIP, and Ecessa are offering various types of cloud-managed SD-WAN services. These are based on WAN edge appliances purchased and owned by the enterprise, but the SD-WAN controller is provided by the vendor as a service. Enterprises must purchase WAN connectivity from carriers directly, and the managed SD-WAN aspects are delivered as an overlay to the enterprise WAN. This option is a good choice for midsize enterprises with highly distributed sites, who desire to manage the solution in-house and have the requisite resources (both expertise and tools) to work with two providers — the underlying WAN provider and the cloud-managed SD-WAN provider. Enterprises that need additional services, such as managed security or WAN optimization, should place specific focus on these as most cloud-managed WAN providers do not include them. Vendors, such as Cato Networks, Cradlepoint, NetFoundry, VeloCloud and Bigleaf Networks, have created SD-WAN overlay services that they promote as "cloud connect" services. These services are based on provider-owned hubs deployed in various internet and telco hotels (colocation centers), that enable these vendors to deliver a managed service overlay to the internet with the intent to route traffic via the best-performing internet path to a specific cloud service. The service does not include local internet, nor does it offer integration with any MPLS services. This option is a good choice for midsize enterprises with extensive use of the internet to connect to cloud services. Enterprises that need additional services, such as managed security or WAN optimization, should place specific focus on these services as most WAN overlay provider do not include them. For vendors such as VeloCloud and Bigleaf, the branch office appliance will forward traffic to the hub closest to the cloud provider, and traffic will forward across the optimum path between the branch office and the provider point of presence (POP). This option is suitable for enterprises that prefer to source their own internet service. For vendors such as Cato, Cradlepoint and NetFoundry, the branch office appliance will forward traffic to the hub closest to the branch office, and the provider will forward traffic across its core WAN to its hub closest to the destination, e.g., a cloud service. For transport between their hubs, providers use various options such as Tier 1 internet transit providers or an optimized internet cloud. This option is suitable for enterprises that need optimized internet connectivity. How should network planners approach SD-WAN service sourcing? Gartner estimate that approximately 20 providers have deployed managed SD-WAN services in their customers' production environments, and enterprise network planners should expect these services to evolve significantly over the next two to five years, both in vendor choice and service terms and conditions. Managed SD-WAN providers that are not tied to a particular vendor (like carriers and SIs) often employ multiple vendors to reduce risk. Enterprise WAN planners should ensure these providers' contractual provisions guarantee consistent performance apart from a particular vendor, because, over the next two to five years, the SD-WAN vendor landscape will consolidate. Given their multivendor nature, clients that use SD-WAN services from these types of providers should not focus on a particular vendor, but instead should focus on service functionality and contract terms and conditions. Expect these providers' service terms and conditions to evolve, as the majority of current SD-WAN services are based on those of managed router services. This also means that enterprises should focus their evaluations on the level of flexibility offered by the provider, such as ease of changing application policies and how fast a new site can be rolled out. Because there is such a variety of service scopes from cloud-managed, SD-WAN overlay only to fully managed, it is important to focus on the scope of service-level agreements and ensure that performance metrics are concisely defined. Surveys, interviews and research of 32 vendors as part of the Competitive Landscape and Market Guide for WAN edge infrastructure. Surveys and interviews of carriers as part of the global network service provider Magic Quadrant. More than 2,300 interactions with current and prospective Gartner clients on the topic of wide-area networking between 1 January 2016 and 1 March 2017. A Research Circle survey conducted between 3 October 2016 and 25 October 2016, among Gartner Research Circle Members — a Gartner-managed panel comprising IT and business leaders. In total, 65 members participated that were: (1) involved in WAN-related discussions and/or strategic decisions for their organizations; and (2) have more than 10 locations. Survey participants included organizations based in North America, Latin America, EMEA and Asia/Pacific. Polling from Data Center Conference presentations, which indicated that: 68% of attendees manage the WAN edge with their own staff; 18% use a network service provider; and 9% use a managed service provider (n = 103). Network leaders must continue to evolve their WAN, driven by enterprises' needs for digital business transformation, the increasing use of as-a-service models and the increased adoption of real-time applications across the WAN. This is creating a need to incorporate the internet as an intrinsic part of the enterprise WAN in concert with MPLS services. Gartner predicts a rapid adoption of internet services for enterprise connectivity needs. We anticipate that by 2020, more than 60% of enterprises will have deployed direct internet access in their branch offices, up from less than 30% in 2016 (see "Predicts 2017: Enterprise Networks and Network Services" ). This evolution to a hybrid WAN means that the branch office WAN solution has become complex to deploy and manage. A Gartner Research Circle Survey conducted October 2016 showed that more than 45% of respondents indicate that complexities involved in managing the WAN are their biggest operational concern. As a consequence, enterprises are now looking for significant simplification of branch office WAN solutions, which is driving adoption of SD-WAN and a desire for further optimization of WAN edge infrastructure or services. A smaller survey of 65 Gartner clients indicates that 36% of respondent are planning to deploy SD-WAN before the end of 2018; and 66% are planning increased use of a managed WAN service by the end of 2018, up from 55% by the end of 2016. Gartner forecasts that spending on SD-WAN products will grow from $129 million in 2016 to $1.24 billion in 2020, a compound annual growth rate (CAGR) of 57% (see "Forecast: SD-WAN and Its Impact on Traditional Router and MPLS Services Revenue, Worldwide, 2016-2020" ). This will impact enterprise use of traditional routers in WAN design. During this period, the legacy router segment will suffer a negative CAGR of 23.2%. As of March 2017, we estimate there are over 3,000 paying SD-WAN customers, with more than 80% of those in production, including more than 100,000 total branches. Retail and financial services have been the verticals that have most aggressively adopted this technology.